Okay...it's done and I finally got a decent picture of the bedskirt. I haven't finished putting all the bedding together so all the pictures are low shots. 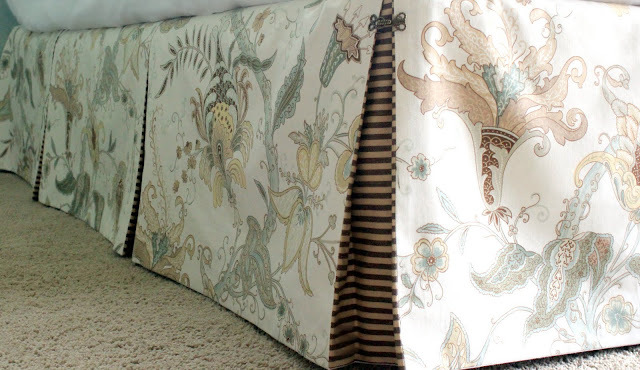 This bedskirt was designed by Autumn, she added contrasting fabric for the box pleats. 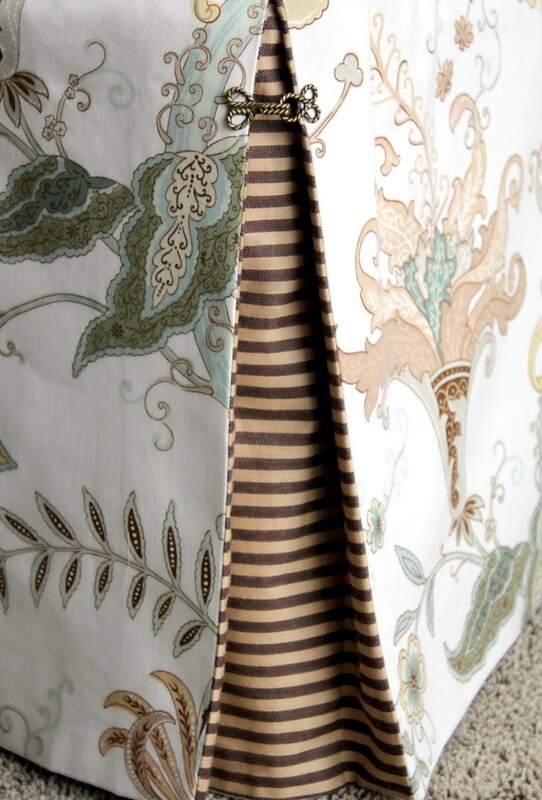 The striped fabric is bold and really brings this bedskirt to life. The bedskirt has seven box pleats all around - two on each bedside, two corners, and one pleat in front. There will be two benches in front of the bed, so most of the detail is on the corner and sides. I added a clasp, as Autumn recommended, to each corner to keep the pleat from pulling too far apart. I did sew 99.9% of this bedskirt...Mom fixed a puckered corner :) The bedskirt was not difficult to sew, because it's all straight lines. The hard part was manipulating the king size amount of fabric! I have had the master bedroom plans from Autumn since early March, but have been paralyzed by fear thinking of how to sew this. I went to my mom for help and she walked me through it on the phone, my little guy was really sick and Mom has diabetes and doesn't get over colds very well, so I couldn't bring my little guy around her. It was a blessing in disguise because it made me do this myself. I have to give a lot of credit to my mom because she could see exactly how to sew this in her head, I could not. Mom has a degree in clothing and textiles and she is a very talented seamstress. I love watching her work with fabric...it is a gift! 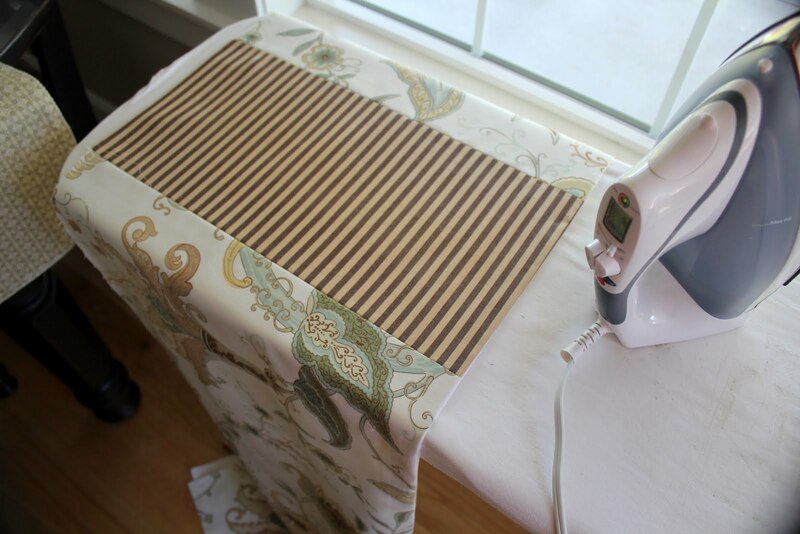 I'm not sure if this is the absolutely correct way to make a box pleated bedskirt, but it worked for us! Sooo, let's see...the first and most important thing when making a bedskirt is to measure, measure, and measure. box spring as the marker. *Measure the foot of the bed, again using the pleated corners as the marker. *Last, measure from the top of the box spring to the floor. 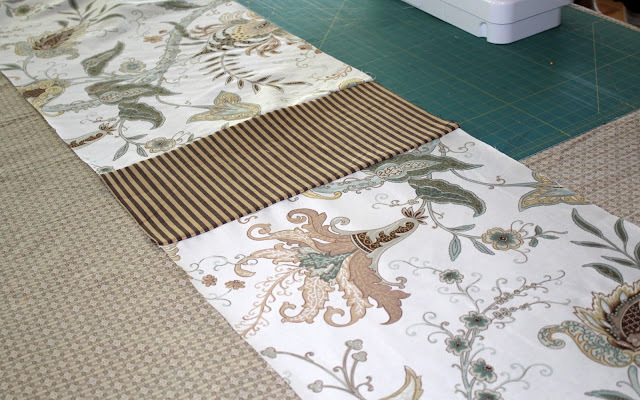 Mom recommended adding one inch seams to everything to leave room for error. You can later serge or cut away the excess. 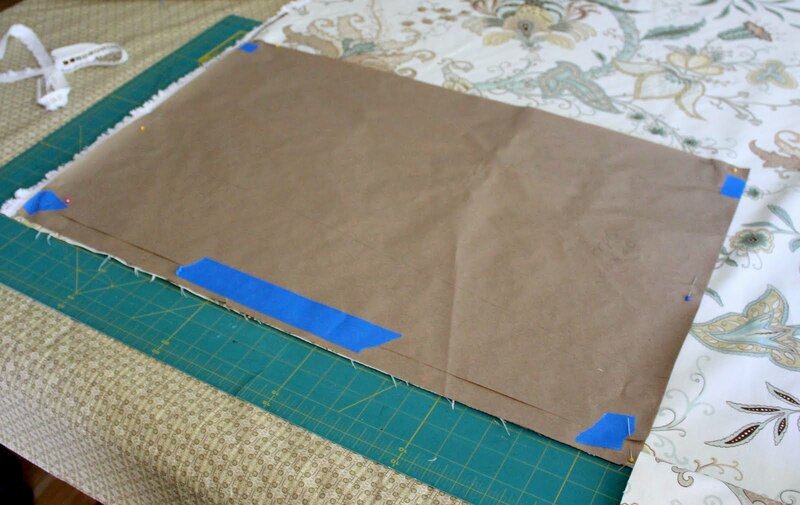 I find that making paper patterns is really helpful and keeps me from making some major mistakes, especially when I'm working with expensive fabric. 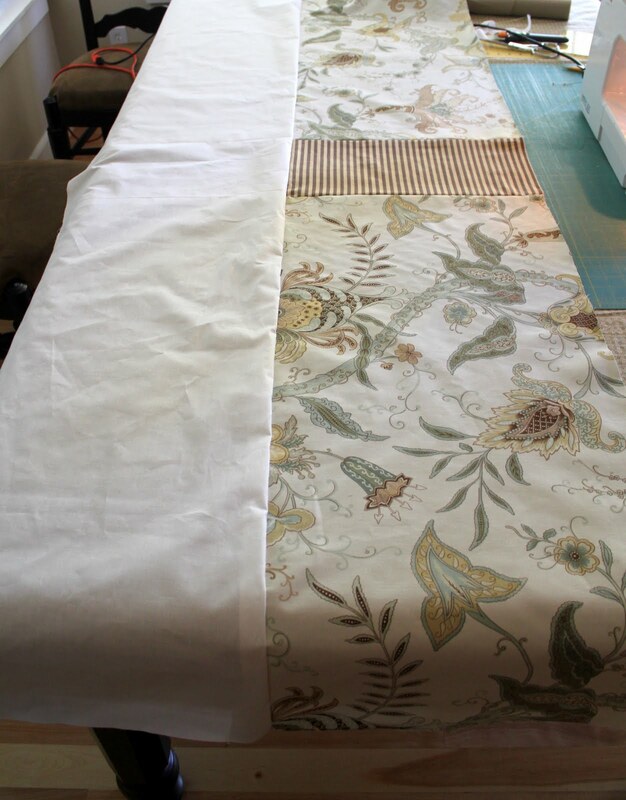 We split the main fabric into thirds on the side, and into two pieces on the foot of the bed. We measured each box pleat in the striped fabric at 8 inches, adding 2 inches for the seam. The length being from the top of your box spring to the floor +2 inches. Next, I sewed each piece together with a 1 inch seam. We made a super long strip with alternating flower and striped fabric. Mom thought we should line the bedskirt to help the fabric hang better. She was right, it made all the difference and finished it off beautifully. I used drapery lining, piecing it together. If I were to to do it again, I would make less seams in the lining by cutting longer strips. Next I sewed right sides together, on one side (the bottom) with a 1 inch seam. especially on the bottom edge. For the box pleats, we found the center of the contrasting fabric and folded over each side to meet the center. In this case the contrasting fabric was 8 inches. We folded in 4 inches on each side to meet the center. Pinned in place and pressed firmly with an iron to set the box pleat. 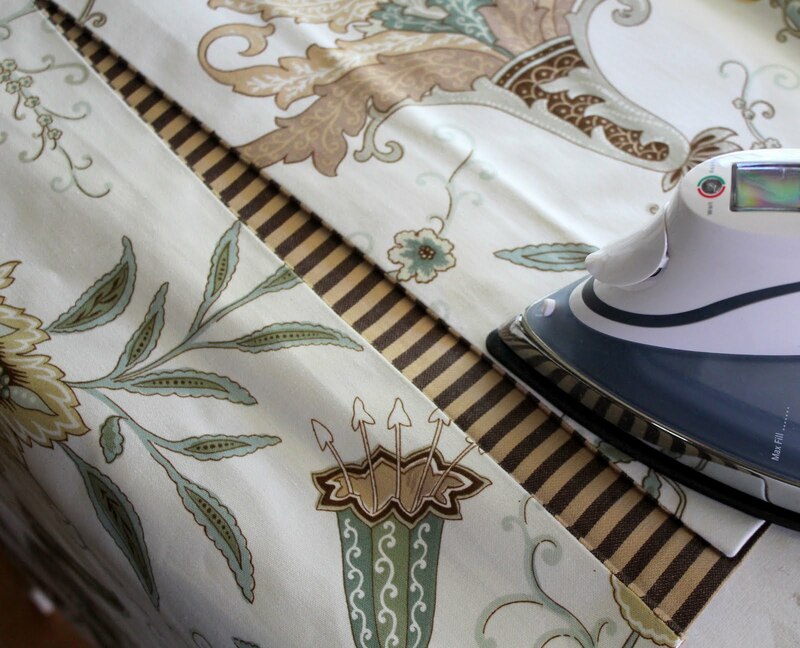 Mom helped me use a pressing cloth so the iron wouldn't damage the fabric. 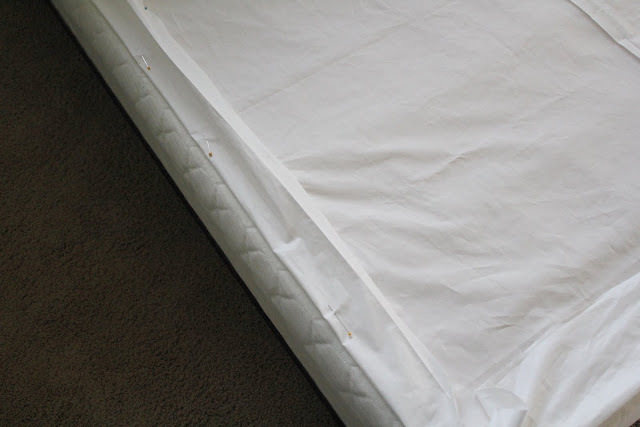 Mom suggested sewing the top fabric shut to keep it from shifting as I attached the bedskirt fabric to the top fabric that goes underneath the mattress. It took me a couple of times to figure out how to attach the bedskirt to the fabric that goes under the mattress. I first tried pinning it inside out (like you would a slip cover), making sure the the bottom of the fabric hit just above the carpet. It was really uneven and difficult guessing. I also had a little helper unpinning as fast as I could pin. I finally gave up that idea and pulled out a bedskirt pattern that recommended cutting the top fabric to fit the box spring, with a 1 inch seam overhang. So much easier! 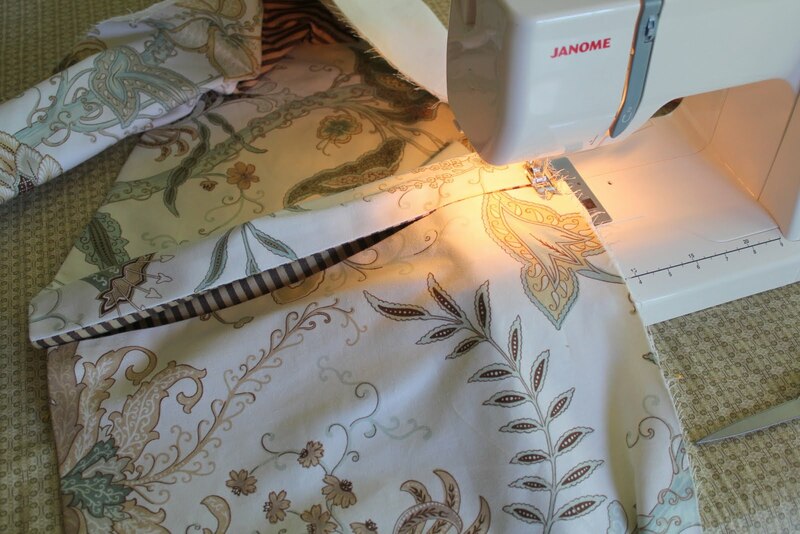 I pinned the fabric to the bed and found the edge, pulling the fabric back and pinning it. Then I took my clear ruler and marked with a fabric pen 1 inch and then cut. 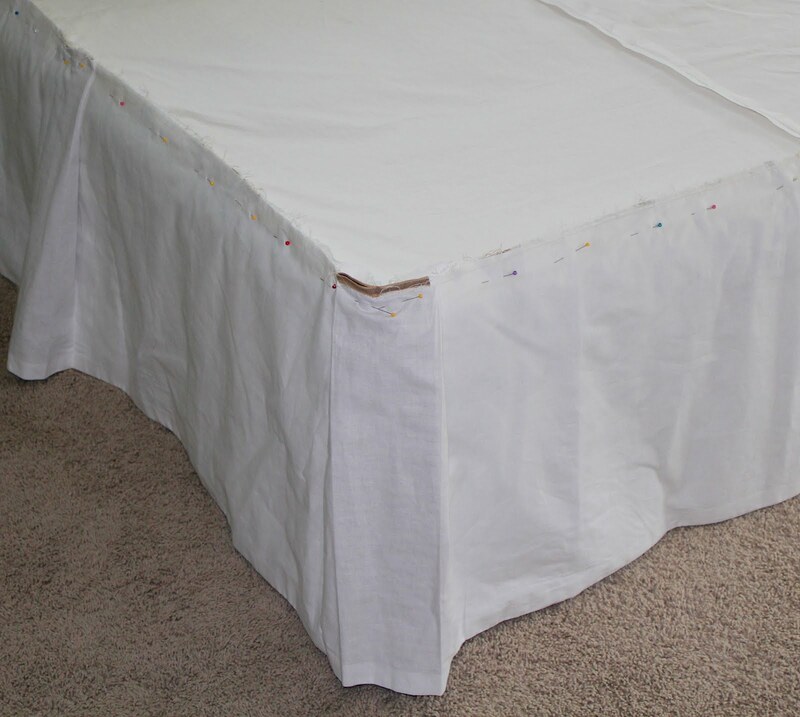 This made it so easy to attach the bedskirt fabric to the top fabric. Next, we pinned all the edges together. We matched our corners matched up and then sewed. I haven't serged my edges yet in case I need to adjust a few things, but I eventually will to prevent the seams from tearing open. A custom fit bedskirt, and so different than what I could find in a store! I know I would have payed a pretty penny to a seamstress to make this plus the cost of fabric. Thanks Autumn for dreaming up such a beautifully designed bedskirt for me! Her attention to detail amazes me. Thanks Mom for your seamstress brain...she really is very talented. I'm so glad she encouraged me that I can do this myself and not to cut corners while sewing. 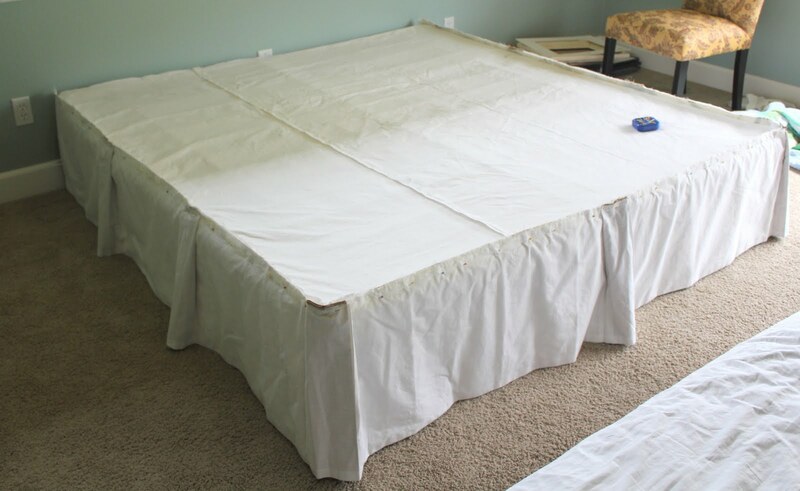 I hope some of you find this somewhat helpful if you ever decide to make your own bedskirt. I sure do appreciate all the people that take the time to share their diy projects on their blogs, it is such a great resource to pull from when you need it. Holy craftopia. Seriously? You just sewed that gorgeous thing your.self? Do you hire out? Amazing. I love the contrasting fabrics...so classy. That looks so professional and what a great tutorial. You rock! SOOOOOOOOOOO pretty! I am way impressed. nothing terrifies me more then a sewing machine. you did an amazing job! that has to be 1 of the most beautiful bedskirts i have ever seen. That photo of your son helping is so sweet it took my breath away! Hi girls! Thanks so much for inviting me over to the WYLTC blog, and for leaving such a sweet comment about my lantern! What a fun party! 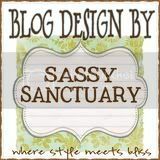 I'm excited to be following your blog now as well! Lovely. Great job. I can certainly relate to handling the large amount of fabric. Very professional---you get a gold star! I am actually making something similar for my daughter. And since you did such a great job, I thought I'd ask a question. I want to take the corners of my box pleats and pull them back and button them, then put a bow at the top of the pleat where they meet. I am estimating that I will need at least 15" (rather than8") of contrast fabric underneath to pull this off. What do you think? I'm also wondering if I should make the middle piece on the sides wider so when the corners are buttoned back, it will look better symmetrically. Any thoughts? I like the idea of a paper pattern. I may try that to see how much contrast to use. Your pictures are fabulous. After searching the net trying to find close ups of box pleated skirts, I found your blog. 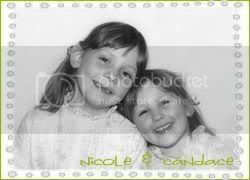 The pictures helped tremendously. And I'm definitely on the right track. The only thing I'm doing differently is making the skirt in 3 pieces (2 sides, 1 foot) with a band at the top of each piece. I have little screws that go into the band and screw right into the box springs to hold the skirt in place. And it never shifts when changing the linens or moving the mattress. The added benefit is that the fabric will be easier to work with. Oh, that is beautiful! Love your fabrics. Thanks for all the pictures...maybe I'll get brave enough to try this someday! 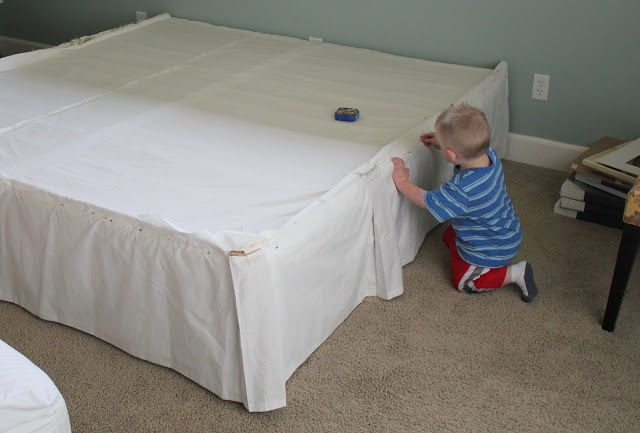 I need to make a bed-skirt for my son's bed. This is a great tutorial. I pinned it to my Pinterest board for reference! I especially like the hook and eye detail that you added! Thanks for sharing! Thanks everyone for all the kind bedskirt comments! 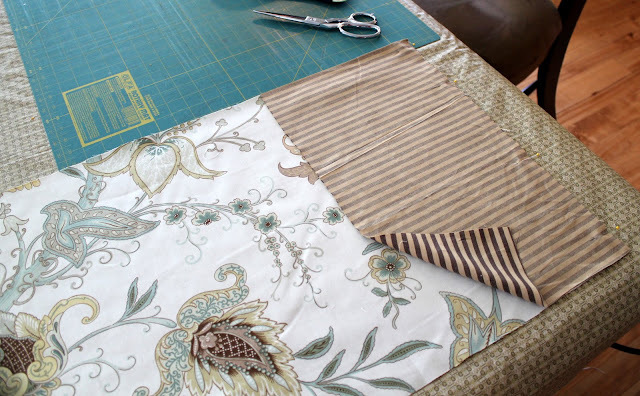 Angela Lee ~ I spoke with my mom and she said to definitely make the contrasting fabric wider (& middle pieces) and to try it out on fabric scraps or paper first to see if it works. The pleats for your daughters bedskirt sound so pretty! Creating a top border with screws to keep the skirt from slipping is genius! I would love to see a picture when you're done. Thanks for stopping by! Thanks Candace for getting back to me. I used paper to get the correct width, and wound up at 23" just for future reference (full size). I have the bottom piece completed. I just have to put the buttons and bow on. When I get the whole thing done, I'll be happy to send you pictures. I learned the screw thing from my interior decorator. She put them on my king size. Then I got a new bed with a wood box springs. So I used small nails; the screws wouldn't work. They were too fragile. Love the bed skirt!! You did a great job. I have a question: You spoke of folding 4 inches on each end of the pleating fabric toward the center. So since it is folded back on itself, isn't the total wide of the insert piece 16 inches plus seams (4 from each folded part and 8 behind them) ? I hope to make a similar skirt. I am a bit confused. OK, I love that bed skirt!! The 2 fabrics go so well together - nice job! I have this linked to my bed skirts post as well today, yours is a keeper!! you did an GREAT job on this! and I appreciate YOU sharing your project as it makes me feel like I could DIY this!! your choice of fabrics is beyond beautiful and you are right, the stripes just POP!!! I never would have thought of using lining, but I can see it gives it a really crisp look. so thank your Mom for that little nugget of inspiration.... I think I will try this! So pretty! And THANK YOU for providing such a great tutorial! Love the combination of prints you use. Will surely make one for my buyers to sell at my online boutique www.LinensnCurtains.com from my own available prints and see if my buyers love it. will keep you updated my creativity here. LUV LUV LUV this, post It looks so beutiful! I love it! Thanks for sharing the "how you did it!"